Anthurium hornitense Croat, sp. nov. TYPE: Panama. Chiriquí: along the road to Fortuna Dam site, N of Gualaca, 22.7 mi. beyond bridge over Río Esti, 1,400 m, 11.8 mi. N of Los Planes de Homito, 10.7 mi. N of junction to tunnel, Croat 48706 (MO 2737238, ho-lotype; PMA, isotype; Live at MO). Planta plerumque epiphytica, interdum terrestris; cataphyllum modice coriacea, persistens in fibris grossis; petiolus subteres interdum, leviter sulcatus, 16-55 cm longus; lamina anguste ovata ad triangulata, modice coriacea, basi leviter ad profunde cordata, 18-44 cm longa, 9-22 cm lata, pagina inferiore glanduloso-punctata; inflorescentia arcuato-pendula; pedunculus 34-48 cm longus, teres; spatha viridis interdum suffusa rubra, modice coriacea, lanceolata, 7-12 cm longa, 1.3-1.5 cm lata; spadix purpureus, 7-20 cm longus; baccae albae. Usually epiphytic, sometimes terrestrial; stems green, to 20 cm long, ca. 4 cm diam. ; internodes very short; leaf scars ca. 2.5 cm wide, sometimes obscured by cataphyll fibers; roots few, green, moderately thin, descending; cataphylls moderately thick, 6-8 cm long, acute at apex, drying brown (B & K Yellow 5/7.5) weathering to coarse fibers and persisting. LEAVES with petioles erect-spreading, 16-55 cm long, 4-6 mm diam., sub-terete, sometimes weakly sulcate; geniculum 2-3 cm long, scarcely thicker and paler than petiole, weakly sulcate; blades narrowly ovate to triangular, moderately thick, long-acuminate at apex, shallowly to deeply lobed at base, 18-44 cm long, 9-22 cm wide, usually broadest near the base, sometimes at point of petiole attachment; anterior lobe 17-34 cm long, the margins straight to weakly convex, posterior lobes 5-14 cm long, from apex of sinus to outermost point; sinus parabolic to hippocrepiform, rarely with the lobes overlapping; both surfaces matte to semiglossy, the lower surface dark, glandular-punctate, markedly paler; midrib convexly raised above, diminishing and sunken toward apex, convexly raised below; basal veins 4-6 pairs, first and sometimes second free to the base, those remaining coalesced 1.2-2 cm, flat to weakly sunken above, raised below, posterior rib naked, the outer margins weakly upturned; primary lateral veins 5-8 per side, departing midrib at 50-55° angle, straight to collective vein, sunken above, raised below; lesser veins scarcely visible, conspicuous on drying; collective vein arising from one of the lowermost basal veins, sometimes from the first or second in smaller blades, loop-connecting the primary lateral veins, 4-6 mm from margin, sunken above, raised below. INFLORESCENCE arching-pendent, as long or longer than leaves; peduncle 34-48 cm long, 5-7 mm diam., terete; spathe pale green, sometimes tinged reddish, moderately thick, lanceolate, 7-12 cm long, 1.3-1.5 cm wide, broadest near base, strongly reflexed at anthesis, long-acuminate at apex, acute at base; spadix deep violet purple, 7-20 cm long, 8-15 mm diam. near base, 4-7 mm diam. near apex; flowers rhombic, 1.8-2 mm long, 2-2.1 mm wide, the sides straight to weakly sigmoid, 5-7 flowers visible in the principal spiral, 7-9 flowers visible in the alternate spiral; tepals matte, lateral tepals 0.6-0.8 mm wide, the inner margin convex; pistils not emergent; stigma linear, ca. 0.7 mm long; stamens emerging from the base, laterals first preceding alternates by 3-5 spirals; anthers yellowish, held over pistil, ca. 0.6 mm in both directions, thecae oblong, not divaricate. INFRUCTESCENCE with white berries. Figs. 90 and 94. 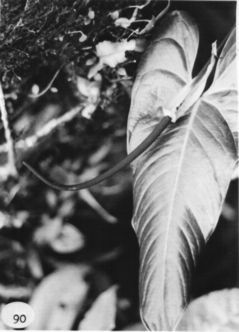 Anthurium hornitense is endemic to Panama and is known only from the Fortuna Dam Road, Cerro Homito (the source of the first collection by Barry Hammel and thus the name A. hornitense), and on Cerro Tute near Santa Fe in Vera-guas Province. It occurs in premontane rain and lower montane wet forest life zones at 1,300 to 1,850m. It is a doubtful member of section Belolonchium and is readily distinguished by its thick, glandular-punctate, cordate blades and violet purple tapered spadix; only one other cordate species in Panama (Anthurium lentil) has glandular punctations. It has scalariform venation with two or more pairs of collective veins roughly paralleling the midrib. Anthurium hornitense is perhaps most closely related to A. lucens Standl. ex Yuncker, A. verapazense Engl., and A. chiapasense Standl., all from Mexico or Middle America (to Honduras), but diners from all of them in having white rather than red to orange berries. Costa Rica Lim—n: 1190 m, 9.23.10N 83.00.25W, 26 July 1989, Gerardo Herrera 3350 (MO). Costa Rica Lim—n: P.N. Cordillera de Talamanca; Cordillera de Talamanca, 1300 m, 09.24.15N 83.05.15W, 6 March 1992, Gerardo Herrera 5171 (CR, MO). anama Chiriquí: 1100 m,, 9 February 1985, Henk van der Werff & Cor van Hardeveld 6780 (MO). 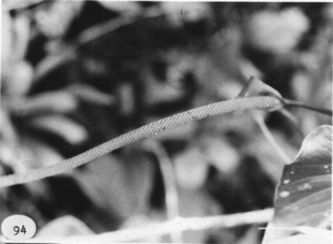 Panama Chiriquí: Fortuna Dam Camp, 1300 m, 8.43N 82.14W, 25 Feb. 1985, Hampshire & Whitefoord 89 (BM). Panama Chiriquí: 1200-1300 m, 8.45N 82.18W, 22 June 1987, Thomas B. Croat 66609 (MO). Panama Chiriquí: 1750-1900 m, 8.41N 82.10W, 22 Sept. 1987, Thomas B. Croat 67980 (MO). Panama Chiriquí: 1750 m,, 27 Dec. 1977, J.P. Folsom, R. Dressler & R. Channell 7215 (MO). Panama Chiriquí: 1100 m, 8.45N 82.13W, 8 Feb. 1984, H.W. Churchill, G. de Nevers & H. Stockwell 4910 (MO). Panama Chiriquí: 1100 m, 8.45N 82.13W, 8 Feb. 1984, H.W. Churchill, G. de Nevers & H. Stockwell 4911 (MO). Panama Chiriquí: 1100 m, 8.45N 82.13W, 8 Feb. 1984, H.W. Churchill, G. de Nevers & H. Stockwell 4912 (MO). Panama Chiriquí: 1100 m, 8.45N 82.13W, 8 Feb. 1984, H.W. Churchill, G. de Nevers & H. Stockwell 4913 (MO). Panama Chiriquí: 1200 m, 8.42N 82.14W, 15 June 1984, H.W. Churchill 5445 (MO). Panama Chiriquí: 1200 m, 8.42N 82.14W, 16 June 1984, H.W. Churchill 5467 (MO). Panama Chiriquí: 08.45N 82.18W, 24 July 1994, Thomas B. Croat & Guanghua Zhu 76372 (MO).